The liquid sheets – less than 100 water molecules thick – will let researchers probe chemical, physical and biological processes, and even the nature of water itself, in a way they could never do before. Water is an essential ingredient for life as we know it, making up more than half of the adult human body and up to 90 percent of some other living things. But scientists trying to examine tiny biological samples with certain wavelengths of light haven’t been able to observe them in their natural, watery environments because the water absorbs too much of the light. Now there’s a way around that problem: A team led by scientists at the Department of Energy’s SLAC National Accelerator Laboratory turned tiny liquid jets that carry samples into the path of an X-ray beam into thin, free-flowing sheets, 100 times thinner than any produced before. They’re so thin that X-rays pass through them unhindered, so images of the samples they carry come out clear. The new method opens new windows on critical processes in chemistry, physics and biology, including the nature of water itself, the researchers said in an April 10 report in Nature Communications. 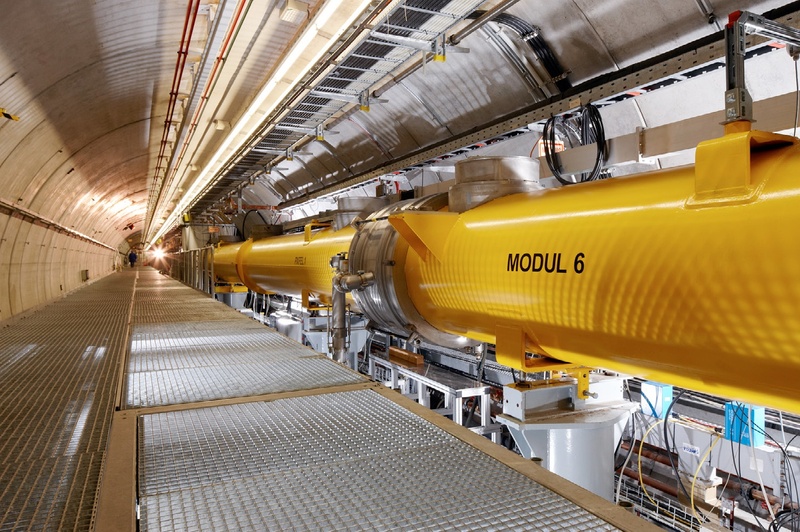 The method was developed at SLAC’s X-ray free-electron laser, the Linac Coherent Light Source (LCLS), but they said it can also work in experiments with synchrotron light sources, tabletop lasers and electron beams. A series of movies shows how increasing flows of gas that shape a stream of liquid affects the formation of liquid sheets and their soap-bubble-like sheen. “This opens up possibilities in a lot of fields,” said SLAC staff scientist Jake Koralek, who led the research with Daniel DePonte, leader of the LCLS Sample Environment Department. “Until now, we haven’t been able to make images of samples suspended in water with two types of light – infrared and ‘soft’, lower-energy X-rays – that are important for studying basic processes in physics, chemistry and biology, including the physics of water,” Koralek said. The nozzle is a tiny glass chip with three microscopic channels. A stream of liquid flows through the middle channel, shaped by flows of gas coming in from the channels on either side. This particular nozzle was made with photolithography, a technique used to manufacture computer chips, but it could also be crafted with 3-D printing, the researchers noted. As the scientists turn up the speed of the gas flow, the liquid stream spreads into a series of sheets whose width and thickness can be precisely controlled. The sheet closest to the nozzle is the widest and thinnest; the farther they get from the nozzle, the narrower and thicker the sheets become until they finally merge into a cylindrical stream. These images show the formation of tiny sheets of liquid shaped by jets of gas from a nozzle developed at SLAC. Top: As the gas flow increases, the liquid sheets become bigger. Bottom: The nozzle produces a series of liquid sheets; the one closest to the nozzle is the widest and thinnest. Each sheet is perpendicular to the previous one, so we are seeing the second and fourth sheets from the side. The sheets shimmer like soap bubbles in a variety of colors, the result of light reflecting off both the front and back surfaces of the sheet. And just as the contour lines on a topographic map mark differences in elevation, the hue and spacing of a sheet’s ever-changing bands of color indicate how thick it is and how much the thickness changes from one point to another. “It’s a very flexible and reliable design for creating both ultrathin and slightly thicker liquid sheets, which can be desirable for some applications” said Linda Young, a distinguished fellow at DOE’s Argonne National Laboratory and professor at the University of Chicago who was not involved in the study. She said she will be using the nozzle to make slightly thicker sheets of water for an LCLS study of how water molecules behave after one of their electrons has been ripped away. These ionized water molecules persist for only a few hundred femtoseconds, or millions of a billionth of a second, and “the X-rays provide a completely new and clean wayto monitor their electronic response in their natural environment, so that’s why we’re excited about it,” Young said. The liquid sheets have already been used in experiments that explore the properties of water in extreme environments like those on giant planets, said co-author Siegfried Glenzer, a SLAC professor and head of the lab’s High Energy Density Science Division. Those experiments were performed with the FLASH free-electron laser at Germany’s Deutsches Elektronen-Synchrotron (DESY). DESY FLASH free-electron laser at Germany’s Deutsches Elektronen-Synchrotron. Researchers used X-ray pulses to heat the liquid sheets to thousands of degrees to simulate the extremely warm, dense form of water present in giant planets like Jupiter. Then they measured the reflectivity and conductivity of the super-hot water with optical laser pulses in the instant before the water vaporized. These measurements could only be made on a flat sheet of water. The team measured the thickness of the sheets with a beam of infrared light at the Advanced Light Source at the DOE’s Lawrence Berkeley National Laboratory, and also demonstrated that the sheets could be used for infrared spectroscopy, where light absorbed by a material reveals its chemical makeup. LCLS and the Advanced Light Source are DOE Office of Science user facilities. In addition to researchers from SLAC, Berkeley Lab and DESY, scientists from the ELI Beamlines Institute of Physics of the Czech Academy of Sciences, Dartmouth College, the University of Alberta in Canada and the European X-ray Free-Electron Laser Facility (European XFEL) in Germany contributed to this work. Major funding came from the DOE Office of Science and the National Institutes of Health, National Institute of General Medical Sciences.